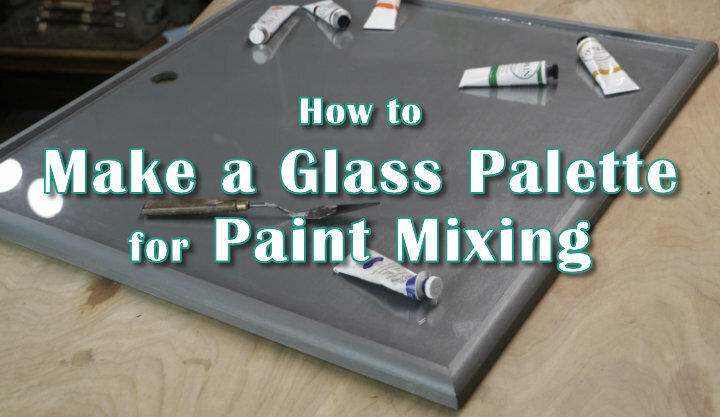 Here’s a guide on how to make a paint palette out of glass. As a perfect glass palette for oil painting (and acrylics) this palette is customizable to any color you can imagine. Maybe you’ve heard that some painters prefer to mix paint on glass? 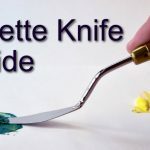 It’s true and today you’ll learn not only the benefits to using a glass mixing palette but how to construct your own reusable palette as well. Because you are not throwing away sheet after sheet of regular palette paper you are actually doing Mother Nature a solid. Build this palette once and use it for almost ever! Unlike store-bought palettes you are not limited to a predefined range of palette sizes, most of which are fairly small. Because the palette you’ll be making is constructed from glass and wood, you can make a gigantic palette. Just remember you need to place it somewhere and you don’t want a palette that is so big you can’t reach across it! When it comes to buying a palette for painting the majority of palettes are either white or wood grained. But this awesome glass artist’s palette can be made any color you wish! The first thing you need to do is get a piece of glass. 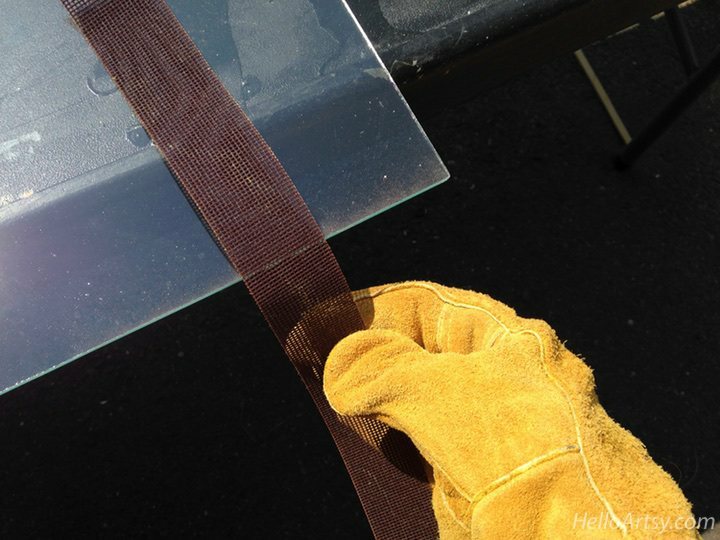 Many places that sell sheets of glass often cut it free of charge or for a small fee. I got my glass at Lowes and they cut it right then and there for me. I had them cut the into a 22.5 inch by 22.5 inch square. They only stocked glass that was 2mm thick so that’s what I went for. I would have liked something slightly thicker but oh well. You might be wondering about the strange size? There’s a reason I promise. I wanted my new glass palette to sit on this little table that I have in my painting studio which measures 24 by 24 inches. Working backwards I calculated that by the time I had four pieces of molding and a little breathing room so the glass could be removed safely, the glass needed to be cut to a 22.5 inch square. Where is your new glass artist palette going? Know the correct dimensions ahead of time. Think ahead my friend! 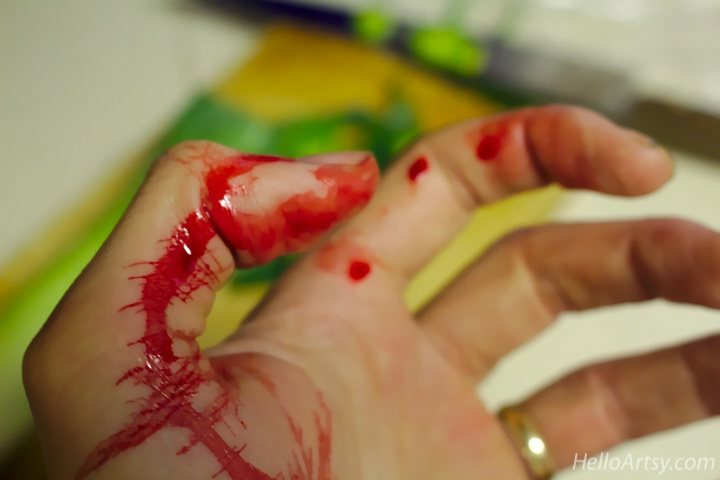 SAFETY NOTE: Glass is very dangerous. Either you sand down the edges and corners with applicable abrasives or have someone do it for you. If the person cutting your glass offers to round off the edges, go for it! If you choose to sand down the edges like I did, make sure you wear gloves and a dust mask and use eye protection. You don’t want to be inhaling glass particles or getting them in your eye. How would you make paintings? Also, use an abrasive file or paper made for filing glass. Regular sand paper is not suitable. That’s me pictured above…. not taking any chances with the glass. I’m wearing thick welder’s gloves! Next you have to cut a piece of flat wood that will serve at the base for the entire palette. I went with 1/2 inch MDF because I know it’s pretty much the flattest wood you can buy for a reasonable amount of money. Most plywoods are significantly warped and I didn’t want to stress my glass while mixing paint on it! Remember to size everything out with your molding. Leave enough room for the glass to fit between the molding. 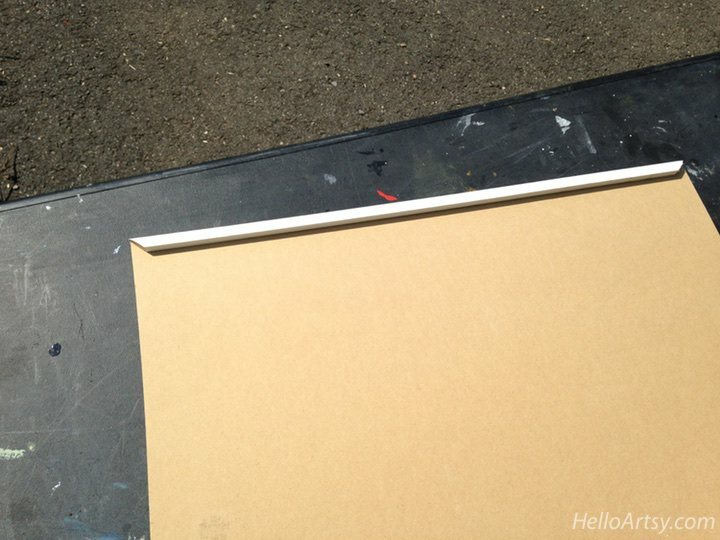 I cut the MDF to 24 x 24 inches. 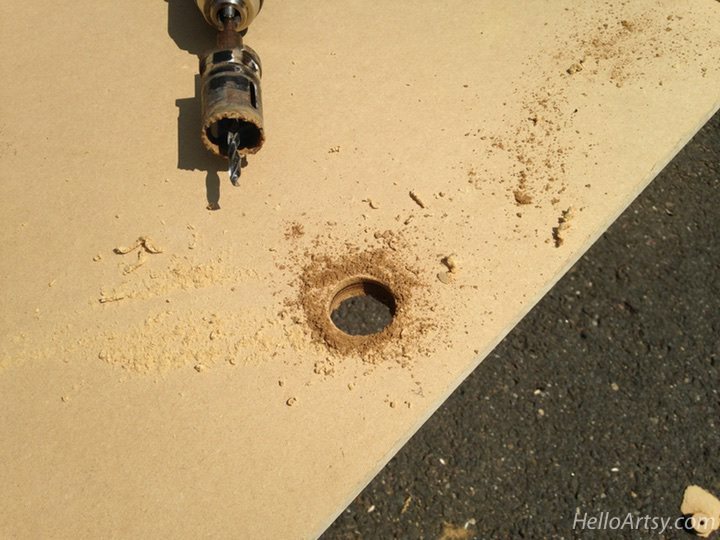 I would drill a hole in the MDF platform. The middle of one side will work great. The whole point of this hole is so you can easily remove and replace the glass at will. Without the hole things could get dicey. The molding I used was called: general purpose finger joint shoe. I choose this because it has a really low profile and is one of the thinnest moldings around. 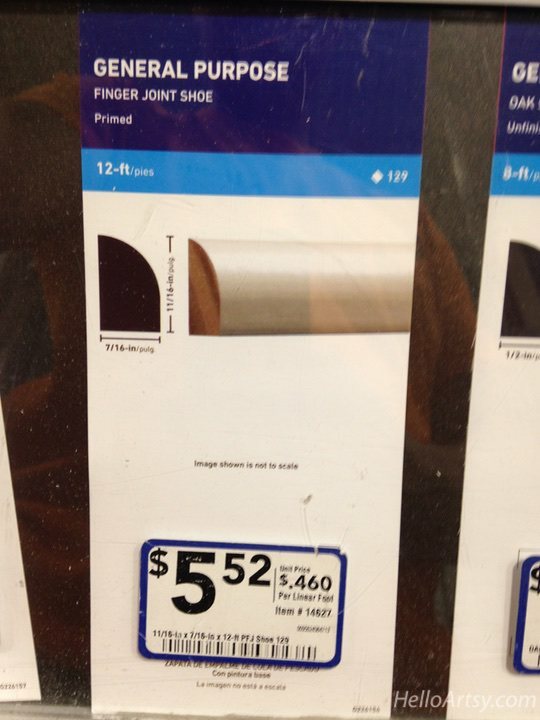 At $5.52 for 12 feet this was a steal… it was even pre-primed! I got fancy and mitered the corners using my trusty ‘ol handsaw miter kit. Off the right (photo below) you can see the molding trailing off to my vegetable box. I was using my cucumber cages to balance out the end of the 12 foot molding. Hey, sometimes you just gotta be creative! Before you glue anything put everything together just to see. 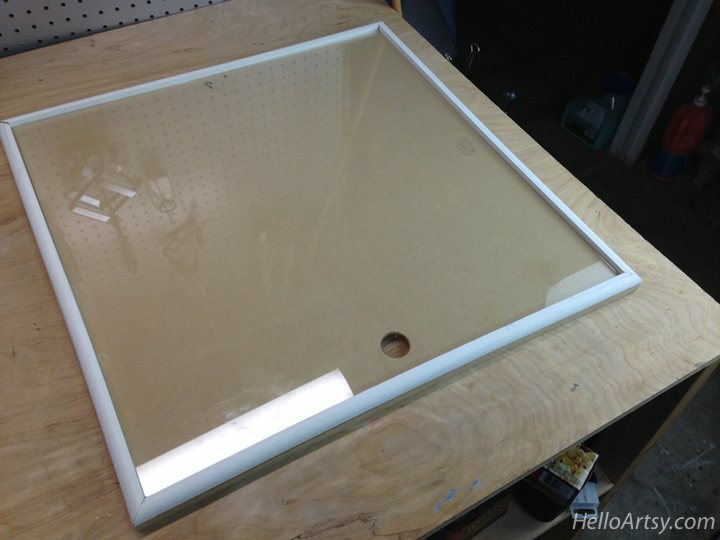 Place all the cut molding on the MDF and place the glass inside. Does it all fit? If not, you need to refigure some stuff before you permanently assemble it. There should be a small amount of room between the molding and the glass edges. You want it close but not too close. Once everything fits together it’s time to glue the molding to the MDF platform. Now’s the time the get that glass out of there! Put it somewhere safe, but out of the way. Join the molding to the MDF with some wood glue, place some weight over the whole shebang and let ‘er dry overnight. 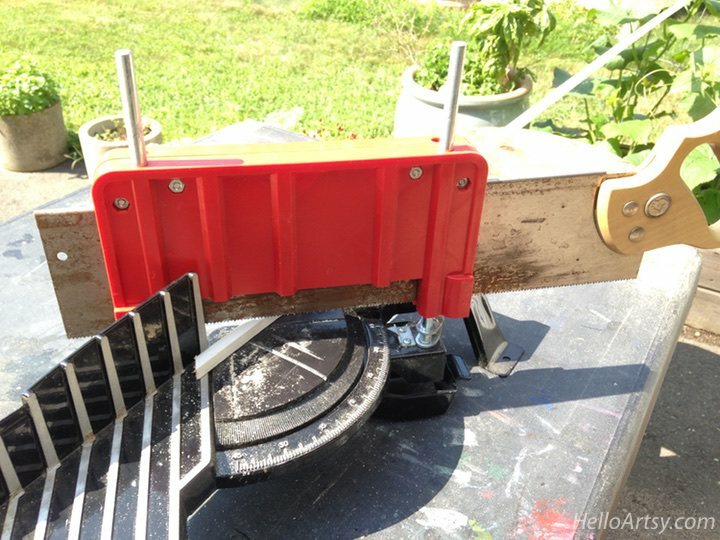 You can also clamp things together if you have those fancy carpenter clamps. Now you have the perfect wooden cradle to hold your glass palette. Finally you can break out the paints! 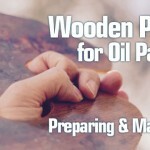 Dust off the wooden cradle and paint it with gesso. This may need two coats. So you always wanted a gray paint palette didn’t you? Well you can have it. Actually you can make the paint palette any color at this point. I choose to paint mine with Liquitex Basics Neutral Gray Value 5. 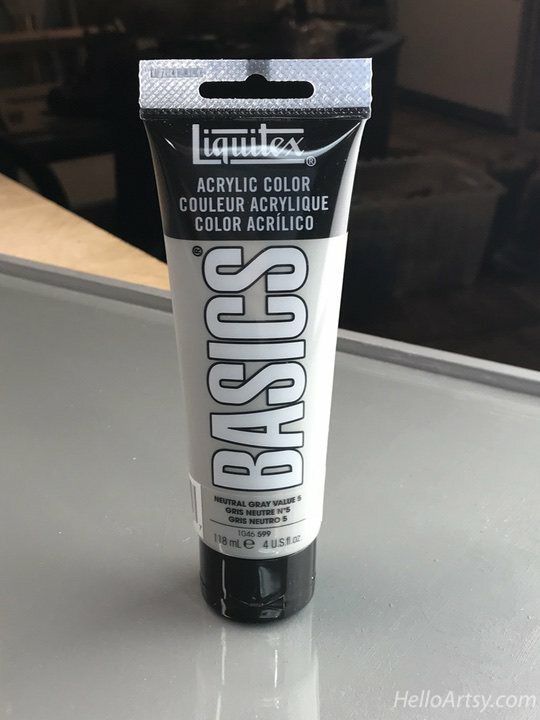 It’s a perfectly neutral color at a medium value. it really is perfect for judging colors against! By the way, I bought the 4 ounce tube (link above) and just about used the whole tube up, so if I were you I would just spring for the bigger 8.4 once tube. 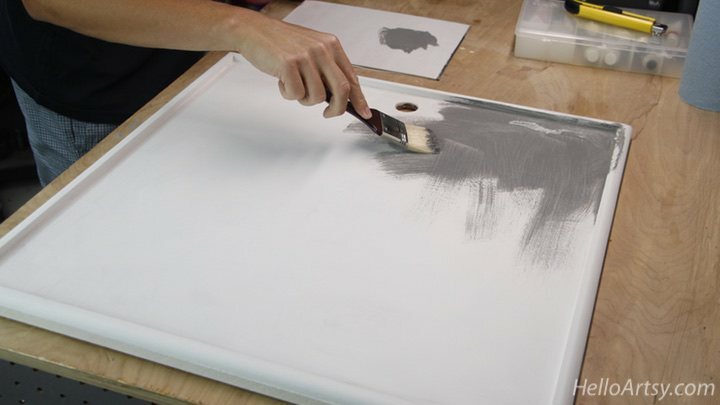 Give your entire glass palette cradle (the wooden part) a coat of gray paint. Keep the paint flat and even. Be careful not to allow the gray paint to pool in the corners and edges or your glass might not fit. That’s it folks. The only thing left to do is carefully place the glass back into the wooden cradle and you have yourself the nicest, custom glass painter’s palette available! Want to try mixing paints on different colored palettes? Don’t repaint your palette. 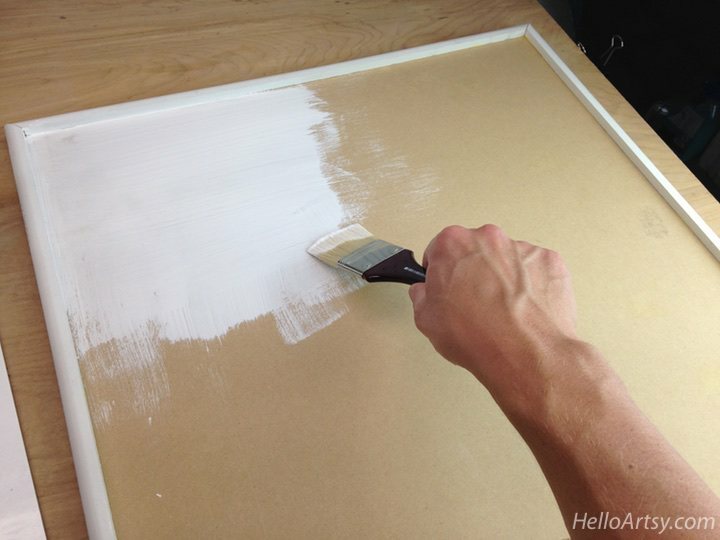 Simply cut a piece of pre-primed canvas to fit underneath the glass and paint it the desired color. You could change your palette color daily if you want… Yippee what fun! Try that with a wasteful book of palette paper. The color of the glass palette is what ever color is underneath. Need to level the glass with the molding? Don’t like that little edge that molding creates. 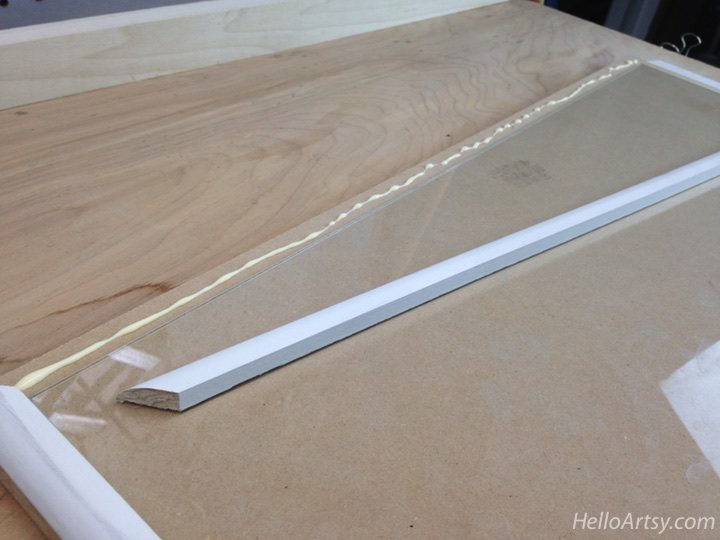 Cut some pieces of thin masonite or hardboard to the same exact size as your glass. Next, stack them underneath until the glass sits flush with the top edge of the molding. I use a hand held wooden palette when I paint in oils but I often run out of room on the wooden palette. 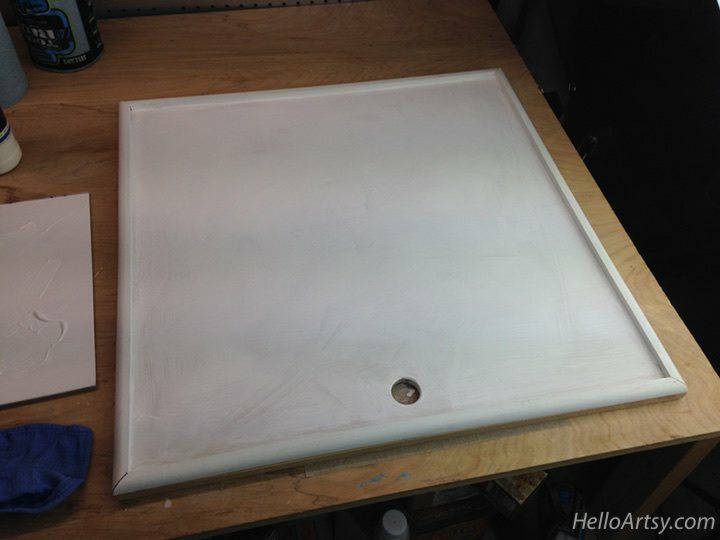 This rather large glass palette that I made will be my main place to mix all of my oil paints and calculate all of the colors I’ll need for a painting. I can then transfer them over to my wooden palette if I want them really close at hand! This way my working palette stays neat and tidy and doesn’t contain a bunch of paint mixtures I’m not using. So you spent a reasonable amount of time constructing your beautiful new palette, it would stand to reason that you’d like to keep it clean. As a general rule of thumb, the longer any paints sit on the glass palette the more difficult it is to clean. Dry paint can be somewhat difficult to remove, but don’t fret we’ll get that stubborn paint off your beautiful new palette! The first thing you should do is remove any blobs and piles of paint with your palette knife. I keep an old phone book handy and wipe the excess paint onto the pages. I then tear our the page(s) and throw them away. Next wipe up the remaining paint with baby wipes. These little miracles are really effective at absorbing paint and not spreading them around. If you are dealing with only wet paint this just about enough to clean the glass off. 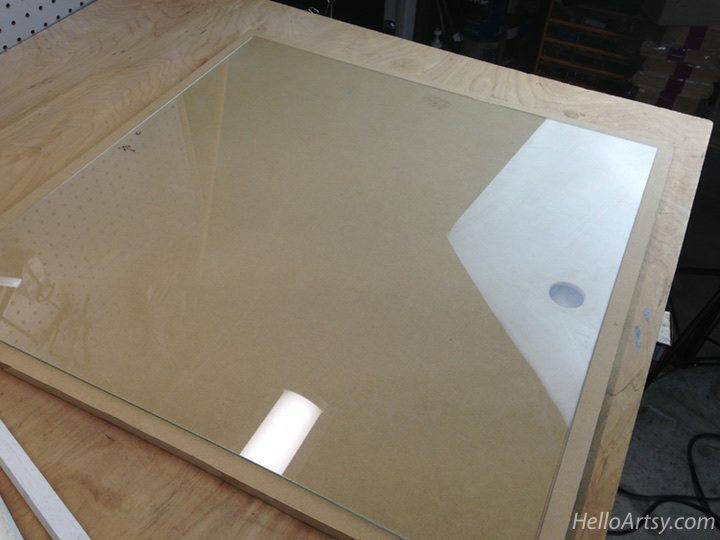 As a final measure I would buff the glass surface with a paper towel or rag to remove any leftover residue. I know everyone like to tout just scrape it with a razor. That’s great in theory but you have to be careful with a razor. You can scratch the glass. I would use a razor as an absolute last resort tool. 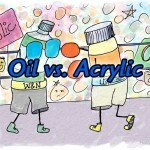 For oils I would sprinkle some thinner onto the palette to loosen up the paint. Once loosened, I would follow the baby-wipe procedure outlined above. Trying to save little piles of oil paints for days or weeks out of sheer frugality is pennywise and pound foolish. You’re going to have to work that much harder trying to clean your palette off. Unless I have a special circumstance going on in the studio I try to clean off my palette daily at the end of the day. It’s part of my wind down procedure. 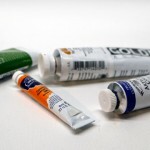 You can soak the dried areas of acrylic paint with some rubbing alcohol. That usually softens up the paint allowing you to remove it. Use your palette knife before your reach for the razor. You don’t want to scratch your glass palette.